The Windows-10 system protection is an useful solution to undo unwanted system changes or restore the OS, this example is also for Windows 8.1 and Seven. The Computer Protection feature creates and stores information about drivers, programs, system files, and settings. Windows automatically creates recovery points prior to major system and software installations or upgrades of Windows 10 Home, Professional, Enterprise and Education x64 / x32 . 1.) ... Please open in Windows 10 system protection settings! 2.) ... Can not activate the computer protection under Windows 10? 1.) Windows 10 system protection settings! Run the command sysdm.cpl or sysdm.cpl ,4 and select the Tab System Protection. And change the system protection settings. See also: ... Create System Restore Point in Windows-10. 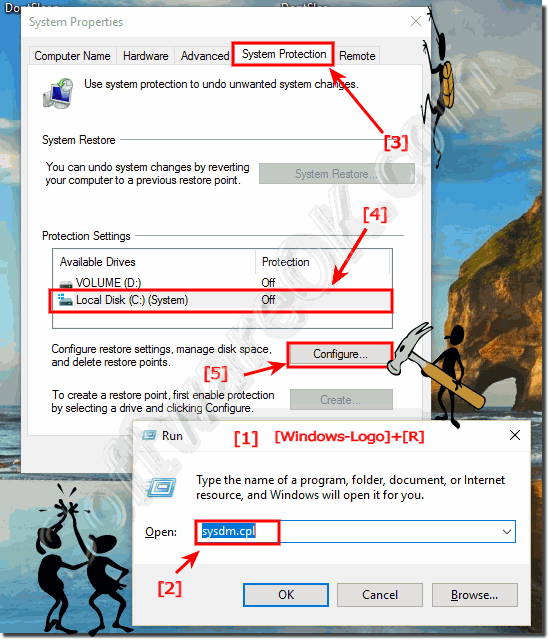 (Image-1) Change system protection settings in Windows-10! Useful info from (c) Microsoft. System protection in Windows-10 is a feature that regularly creates and saves information about your computer's system files and settings. System protection also saves previous versions of files that you've modified. It saves these files in restore points, which are created just before significant system events, such as the installation of a program or device driver. They're also created automatically once every seven days if no other restore points were created in the previous seven days, but you can create restore points manually at any time. System protection is automatically on for the drive that Windows is installed on. System protection can only be turned on for drives that are formatted using the NTFS file system. There are two ways that you can take advantage of system protection: If your computer is running slowly or isn't working properly, you can use Windows-10 System Restore to return your computer's system files and settings to an earlier point in time using a restore point. For more information about System Restore, see System Restore: frequently asked questions. If you accidentally modify or delete a file or folder, you can restore it to a previous version that's saved as part of a restore point. For more information about previous versions, see Previous versions of files: frequently asked questions. 2.) Can not activate the computer protection under Windows 10? Fix some crashes or problems in Windows 10, search for corrupted, missing files, or features! ►► For missing files or features in Windows 10, use System File Checker! Windows-10 - FAQ-182: Change the Windows-10 system protection to undo system changes! Can i using Windows 10 System Protection For Surface Tablets? How to Use System Restore on Windows 10 MS Computers? How to Enable System Restore in Windows 10? How to Disable System Restore in Windows 10? Search for Windows 10 Tip how to Turn On System Restore? Enable system protection in Windows 10? How does Windows 10 Redstone Update turn off System Protection? Can i Configure System Restore In Windows 10? How to Enable or Disable System Restore in Windows 10? How to Change the settings of Windows-10 system protection? How to Turn On System Protection in Windows 10? How to use System Restore on Windows 10? Turn On and Enable System Restore in Windows 10? Windows 10 System Protection Cannot Be Turned On / Off?